Woke to the alarm early, then finished packing up and we were out by just after 8:30. By the time we dumped and were headed out it was close to 9:00. Stopped to pick up breakfast about a half hour later, then headed almost due north for the next six hours, stopping for fuel twice, to top off before getting to New York State, as their prices appear to be about twenty cents per gallon higher than in Pennsylvania. Arrived at just about 5:00, discovering that quite a few people were already here, a big change from the empty horse camp that was in Maryland. We cast around for a spot, and finally settled on one that was right next to a spigot and that seems to have a built up, level gravel parking pad, perfect for the RV even if it rains. Some parts of the camp are a bit slope-y, so this was a good spot. 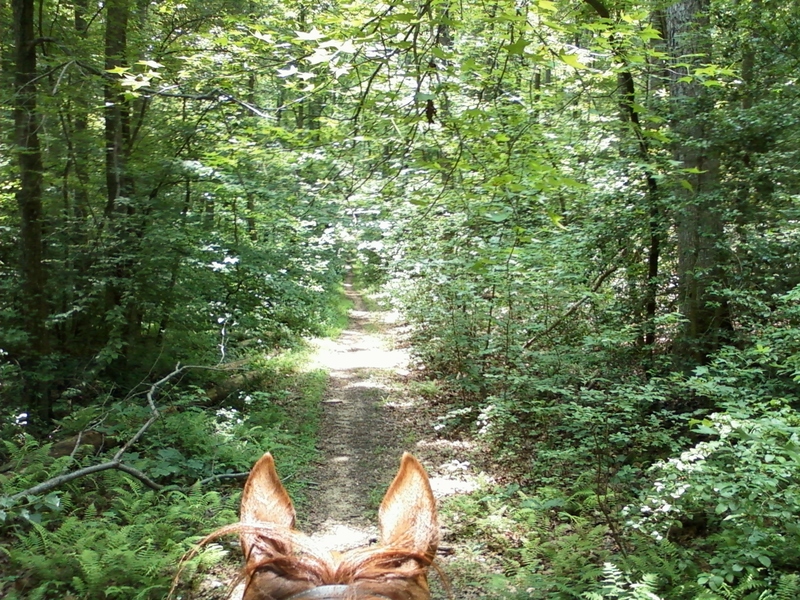 The trees for the highline were a bit close together, so the horses won’t have as much room to walk around as usual, but if no one comes in across from us over the weekend, we may move them over to some other trees closer to the edge of the woods where we can put a longer line. It’s a lovely spot. There’s a fire tower in the middle of the area, pavilions, cabins, and a bathroom with running water, though no showers. Really nice, and the most incredible thing is that it’s free! You gotta love that! Looking forward to checking out the trails here, the maps show over 40 miles of trails that we hope to have time to explore. As things stand now, we’ll probably be here for about two weeks, though there is another place not far away I may want to check out before heading north again. The weather is a good 15 degrees coolers, so we changed from shorts to sweats before the evening was through. Sun didn’t set until way after 9:00, with twilight lasting till almost 10:00! I’d forgotten how long the days were at this latitute! Tired though, after the long day, so heading to be soon. Our original plan had been to leave today, head out to New York State in one long drive, but not surprisingly, we were both too tired from our day yesterday, and had too many chores to do in preparation of the drive, plus the weather forecast called for a 60 percent chance of rain today, both here and at our destination. So we decided to spend the day getting ready, doing laundry and a few chores. Hubby also had to run back to Alexandria to pick up a package we forgot to get yesterday. We were able to get almost everything packed up at a leisurely pace, so we should be able to get out nice and early tomorrow, which we’ll need for the long day. Worked with a new client in Alexandria all day today. Spent the day getting ready for our work day tomorrow, and resting after our long ride yesterday. With one more ride left here, and a day to recover before our Monday job, we decided to make it a long ride today. Heading out the Orange Trail counterclockwise again, we did the White Trail counterclockwise, which was the reverse of what we had done on Wednesday, then took the big side of the Blue loop counterclockwise as well. The Blue trail turned out to be the prettiest trail yet, very woodsy and charming. Again, we did lots of trots and canters today, with the horses really getting into it, seemingly preferring the faster pace than a simple walk. 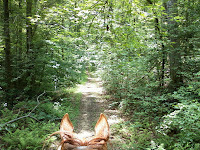 Hubby just seems to want to trot like crazy lately, it seems he’s getting ready for some longer and faster trails! Must be the longer days of summer getting to him! A fabulous day, we are truly loving this park, happy that we’ve found a great base for whenever we have to be in D.C. Looking forward to our next trip here, so we can start to discover some of the more off-the-beaten-track trails that aren’t on the map. Another great ride today! Decided to take the entire Orange Trail loop clockwise today. 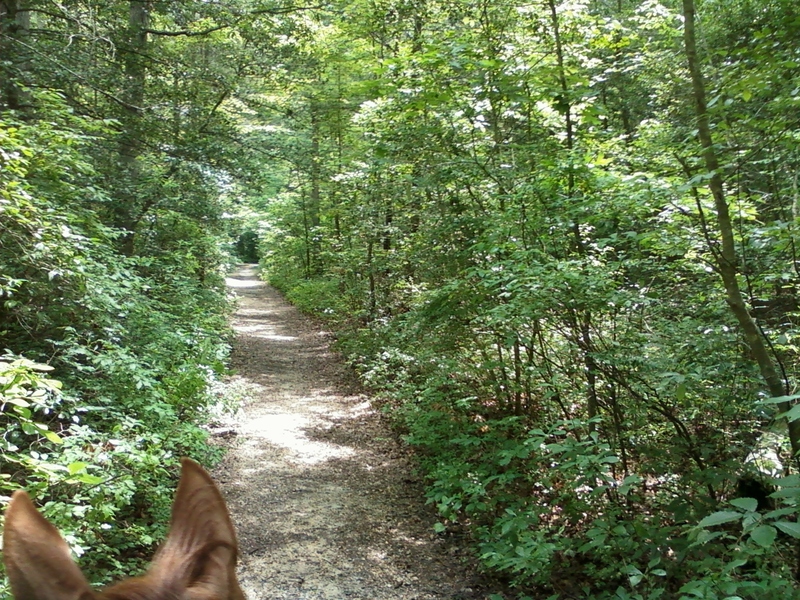 Not as nice as the other trails we’ve taken so far, quite a few parts of it go through some areas that have been cleared in recent years, so it was more open and less “forest-y.” We did have a lot of chances to jog and canter, which was lots of fun, and the 7 mile trail was just the right length for what we were in the mood for. Still a nice ride, great footing, and a great day! Had planned on riding today, but ended up having to run out to do some shopping and other errands and chores and ran out of time. Spent the day on the computer trying to make arrangements for our various requirements in July in upstate New York, and doing chores around the house. Otherwise a rare ordinary day. 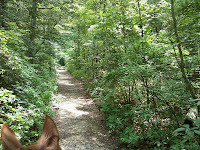 Slept late again, which was much needed, then had breakfast and headed out on the trail. I’ve read good things on the internet about the trails here, so our expectations were high, and I have to say, we weren’t disappointed! The trails are mostly dirt with a few pebbled areas, numerous bridges and boardwalks over streams and muddy areas, excellent trail markings, and my Trailsource map was accurate, though there are a number of unmarked trails and roads that go off the marked trails (fodder for another day’s ride, though that day may be on future trip here). We took the Orange Trail counter clockwise to the White Trail loop, then a short bit up the Blue trail back to the Orange and back to the camp. Did some nice jogging, trying to continue to improve our horses’ conditioning. Loved, loved, loved the trails, really enjoyed the day. This place is a well-kept secret that deserves more notice! Slept late, napped in the afternoon, did little today except get registered for the week, the result of a lengthy and (at last) positive conversation with the local manager, who had to clear it with HIS boss before agreeing to honor the senior discount, at least for the weekdays. Everything else was a mundane day, just what we needed to recharge our batteries. Looking forward to a ride tomorrow!